^ 1.0 1.1 Yamaha Corporation licenses its XG Soft Synthesizer to Square Soft. Yamaha Corporation. 1998-04-21 [2010-05-24]. （原始内容存档于2008年2月2日）. ^ Kamen, Matt. Final Fantasy VII iOS is finally here. Wired UK. 2015-08-19 [2015-08-19]. ^ D'Orazio, Dante. Final Fantasy VII port is now on PS4. The Verge. 2015-12-05 [2015-12-05]. ^ 4.0 4.1 Final Fantasy VII（PlayStation） on VGChartz. [2017-02-25]. ^ 5.0 5.1 Final Fantasy VII International (PlayStation) on VGChartz. [2017-02-26]. ^ 6.0 6.1 6.2 Final Fantasy VII North American instruction manual. Sony Computer Entertainment. 1997: 15, 44–46. SCUS-94163. ^ 7.0 7.1 7.2 7.3 7.4 Austin, Steve. Final Fantasy VII for PlayStation Review. GameSpot. CBS Interactive. 1997-09-27 [2008-07-16]. （原始内容存档于2008-07-25）. ^ 8.0 8.1 8.2 8.3 8.4 8.5 8.6 McLaughlin, Rus. IGN Presents: The History of Final Fantasy VII. IGN. News Corporation. 2008-04-30 [2008-09-14]. ^ Square Electronic Arts (编). Final Fantasy VII North American instruction manual. Square Electronic Arts. 1997: 20–25. SCUS-94163. ^ 10.0 10.1 10.2 10.3 Boor, Jay. Final Fantasy VII Review. IGN. News Corporation. 1997-09-03 [2008-07-16]. ^ Square Electronic Arts (编). Final Fantasy VII North American instruction manual. Square Electronic Arts. 1997: 35. SCUS-94163. ^ White, Finn. Guides: Final Fantasy VII – Characters. IGN. NewStorys Corporation. [2008-09-14]. ^ Official U.S. PlayStation Magazine August 2001; issue 47. Ziff Davis. 2001: 16. ^ 14.0 14.1 Studio BentStuff (编). Final Fantasy VII Ultimania Ω. Square Enix. 2005: 217. ISBN 4-7575-1520-0 （日语）. ^ Square Co, Final Fantasy VII, PlayStation, SCE America, 1997-09-07, Aerith: What rank were you? / Cloud: Rank? / Aerith: You know, in SOLDIER. / Cloud: Oh, I was... First Class. ^ Studio BentStuff (编). Final Fantasy VII Ultimania Ω. Square Enix. 2005: 30. ISBN 4-7575-1520-0 （日语）. ^ Square Electronic Arts (编). Final Fantasy VII North American instruction manual. Square Electronic Arts. 1997: 11. SCUS-94163. ^ Square Co, Final Fantasy VII, PlayStation, SCE America, 1997-09-07, Shera: He pushed the Emergency Engine Shut Down switch, aborting the mission, to save my life. After that, the Space Program was cut back and the launch was canceled. ^ Studio BentStuff (编). Final Fantasy VII Ultimania Ω. Square Enix. 2005: 46. ISBN 4-7575-1520-0 （日语）. ^ Square Electronic Arts (编). Final Fantasy VII North American instruction manual. Square Electronic Arts. 1997: 10. SCUS-94163. ^ Square Co, Final Fantasy VII, PlayStation, SCE America, 1997-09-07, Aerith: You okay? This is a church in the Sector 5 slums. [You] suddenly fell on top of me. You really gave me quite a scare. / Cloud: ......I came crashing down? / Aerith: The roof and the flower bed must have broken your fall. You're lucky. ^ Square Co, Final Fantasy VII, PlayStation, SCE America, 1997-09-07, Aerith: Say, Cloud. Have you ever been a bodyguard? You DO do everything, right? / Cloud: Yeah, that's right. / Aerith: Then, get me out of here. ^ Square Co, Final Fantasy VII, PlayStation, SCE America, 1997-09-07, Cloud: Why is Shinra after Aerith? / Elmyra: Aerith is an Ancient Cetra. The sole survivor. ^ Square Co, Final Fantasy VII, PlayStation, SCE America, 1997-09-07, President Shinra: She's the last surviving Ancient... Don't you know? They called themselves the Cetra, and lived thousands of years ago. Now they are just a forgotten page in history. / Red XIII: Cetra... That girl, is she a survivor of the Cetra? / President Shinra: Cetra, or the Ancients will show us the way to the 'Promised Land.' I'm expecting a lot out of her. / Red XIII: The Promised Land? Isn't that just a legend? / President Shinra: Even so, it's just too appealing to not to pursue. It's been said the Promised Land is very fertile. ...If the land is fertile... / Barret: Then there's gotta be Mako! / President Shinra: Exactly. That is why our money-sucking Mako Reactor is a necessity. The abundant Mako will just come out on its own. ^ Square Co, Final Fantasy VII, PlayStation, SCE America, 1997-09-07, Cloud: ...Did it get away? Jenova...? / Red XIII: Jenova Specimen... Looks like it went to the upper floor using that elevator for the specimens. ^ Studio BentStuff (编). Final Fantasy VII Ultimania Ω. Square Enix. 2005: 57. ISBN 4-7575-1520-0 （日语）. ^ Square Co, Final Fantasy VII, PlayStation, SCE America, 1997-09-07, Aerith: How do you intend to become one with the Planet? / Sephiroth: It's simple. Once the Planet is hurt, it gathers Spirit Energy to heal the injury. The amount of energy gathered depends on the size of the injury. ...What would happen if there was an injury that threatened the very life of the Planet? Think how much energy would be gathered! Ha ha ha! And at the center of that injury, will be me. All that boundless energy will be mine. By merging with all the energy of the Planet, I will become a new life form, a new existence. Melding with the Planet... I will cease to exist as I am now. Only to be reborn as a "god" to rule over every soul. / Aerith: An injury powerful enough to destroy the Planet? Injure... the Planet? / Sephiroth: Behold that mural. The Ultimate Destructive Magic... Meteor. ^ 29.0 29.1 Studio BentStuff (编). Final Fantasy VII Ultimania Ω. Square Enix. 2005: 210–215. ISBN 4-7575-1520-0 （日语）. ^ Square Co, Final Fantasy VII, PlayStation, SCE America, 1997-09-07, Ifalna: A small number of the surviving Cetra defeated Jenova, and confined it. ^ 31.0 31.1 Studio BentStuff (编). Final Fantasy VII Ultimania Ω. Square Enix. 2005: 198. ISBN 4-7575-1520-0 （日语）. ^ Square Co, Final Fantasy VII, PlayStation, SCE America, 1997-09-07, Cloud: Sephiroth! I know you're listening! I know what you want to say! That I wasn't in Nibelheim five years ago. That's it, isn't it? / Sephiroth: I see you finally understand. / Cloud: But, I want to ask you one thing. Why... why are you doing this? / Sephiroth: Ha, ha, ha...... I want to take you back to your real self. The one who gave me the Black Materia that day... Who would have ever thought a failed experiment would prove so useful? Hojo would die if he knew. / Cloud: Hojo!? What does he have to do with me!? / Sephiroth: Five years ago you were... ...constructed by Hojo, piece by piece, right after Nibelheim was burnt. A puppet made up of vibrant Jenova cells, her knowledge, and the power of Mako. ^ Studio BentStuff (编). Final Fantasy VII Ultimania Ω. Square Enix. 2005: 58. ISBN 4-7575-1520-0 （日语）. ^ Square Co, Final Fantasy VII, PlayStation, SCE America, 1997-09-07, Barret: Execution!? What're ya gonna get by executin' us? / Rufus: You are to be executed for causing this situation. People are ignorant. They'll feel better as long as someone is punished. / Barret: I take back what little praise I had for this damn jackass! / Rufus: Well, enjoy your last moments together. ^ Studio BentStuff (编). Final Fantasy VII Ultimania Ω. Square Enix. 2005: 591. ISBN 4-7575-1520-0 （日语）. ^ Yoshinori Kitase interview. Level (Reset Media). May 2008, (25) （瑞典语）. ^ IGN Staff. FFVII Not Being Remade – Nomura. IGN. News Corporation. 2007-06-04 [2008-04-15]. ^ Yasunori Mitsuda. My Friends: Masato Kato. Our Millennial Fair. Procyon Studio. November 1999 [2010-12-29]. （原始内容存档于2011年1月27日）. ^ Bjarneby, Tobias. De missanpassade. Level (Reset Media). April 2006, (1): 38–46 （瑞典语）. ^ 41.0 41.1 41.2 The Making Of: Final Fantasy VII. Edge (Future Publishing). May 2003, (123): 108–113. ^ Vestal, Andrew. The History of Final Fantasy. GameSpot. CBS Interactive. [2008-07-16]. ^ 43.0 43.1 Leone, Matt. Final Fantasy 7: An oral history. Polygon. 2017-01-09 [2018-02-22]. ^ Electronic Gaming Monthly October 2005; issue 196. Ziff Davis. 2005: 104. ^ 45.0 45.1 Final Fantasy SGI Demo. RPGamer. [2008-07-16]. （原始内容存档于2007年9月30日）. ^ 46.0 46.1 Sutherland, Kenny. Elusions: Final Fantasy 64. Lost Levels. [2008-07-16]. ^ Iwata Asks - Yoshio Sakamoto & Hironobu Sakaguchi. Iwata Asks. Nintendo. [2011-08-23]. ^ Nobuo Uematsu Interview. RPGamer. 2000-07-08 [2008-08-05]. （原始内容存档于2012年9月30日）. ^ PlayStation's Final Fantasy VII Marketing Blitz Continues. Find Articles; originally published in Business Wire. August 1997 [2008-07-16]. ^ Final Fantasy VII - International Version. RPGamer. [2008-09-14]. （原始内容存档于2012年1月23日）. ^ 54.0 54.1 Olafson, Peter. Review: Final Fantasy VII. GamePro. 2000-11-24 [2008-07-16]. （原始内容存档于2008-10-23）. ^ ファイナルファンタジーVII インターナショナル. Sony. Sony. [2010-08-26] （日语）. ^ Burt, Andy. Final Fantasy VII downloaded 100,000 times in two weeks. GamePro. 2009-06-23 [2010-09-05]. （原始内容存档于2009-06-28）. ^ FINAL FANTASY VII (PC DOWNLOAD). Square Enix Online Store North America. [2012-12-27]. ^ Final Fantasy 7 is coming to PlayStation 4 next year.Polygon.Dec 06, 2014. [Dec 07, 2014]. ^ Schweitzer, Ben; Gann, Patrick. Final Fantasy VII OST. RPGFan. [2008-07-16]. ^ SQUARE ENIX MUSIC. Square Enix North America. [2008-07-16]. （原始内容存档于2006-11-09）. ^ Gann, Patrick. Piano Collections Final Fantasy VII. RPGFan. [2008-07-16]. ^ Castro, Juan. Final Fantasy VII Advent Children. IGN. 2005-10-06 [2008-07-16]. （原始内容存档于2007-10-12）. ^ Gann, Patrick. Kingdom Hearts -Final Mix- Additional Tracks. RPGFan. [2008-07-16]. ^ Classic FM - Hall of Fame - Position 16. ^ Final Fantasy VII for PlayStation. GameRankings. [2010-12-20]. ^ Final Fantasy VII for PC. GameRankings. [2010-12-20]. ^ Final Fantasy VII for PlayStation Reviews. Metacritic. [2013-07-13]. ^ 1UP Staff. Final Fantasy VII Review. 1UP.com. 2000-01-01 [2008-07-16]. （原始内容存档于2012-11-06）. ^ Final Fantasy VII (Greatest Hits). Allgame. Rovi Corporation. [2012-09-04]. （原始内容存档于2010-01-02）. ^ Final Fantasy VII (PC). Allgame. Rovi Corporation. [2012-09-04]. （原始内容存档于2014-11-14）. ^ Computer and Video Games - Issue 192 (1997-11)(EMAP Images)(GB). archive.org. ^ SquareSoft. Edge Reviews Database. [2008-09-13]. （原始内容存档于2011-07-13）. ^ Final Fantasy - famitsu Scores Archive. Famitsu Scores Archive. [2008-07-16]. （原始内容存档于2008-07-14）. ^ Slo Mo (编). Official U.S. PlayStation Magazine (109). IDG Communications Media: 46–47. October 1997. ^ Olafson, Peter. Final Fantasy VII Review. [2012-09-04]. （原始内容存档于2010-02-22）. ^ Nomali, Nicola. Parish, Jeremy, 编. Final Fantasy VII: The Voice of the Planet. GameSpite Quarterly. 2009-03-30, (13) [2012-01-29]. ^ Dulin, Ron. Final Fantasy VII (PC). GameSpot. CBS Interactive. 1998-07-07 [2010-03-08]. ^ Final Fantasy VII review (PC). IGN. News Corporation. 1998-06-24 [2010-03-08]. ^ 90.0 90.1 90.2 Kennedy, Sam; Steinman, Gary (编). Official U.S. PlayStation Magazine August 2001; issue 47. Ziff Davis. 2001: 98. ^ Frost, Stephen (编). PlayStation: The Official Magazine (1). Imagine Media: 18. 1997-09. ^ 92.0 92.1 92.2 Wolf, Michael. Final Fantasy VII. PC Gamer US. September 1998 [2010-04-14]. （原始内容存档于2000-02-29）. ^ 93.0 93.1 93.2 93.3 Nguyen, Thierry. Final Fantasy VII. Computer Gaming World. 1998-09-25 [2010-04-14]. （原始内容存档于2000-10-01）. ^ 94.0 94.1 94.2 94.3 Bauman, Steve. The console's greatest RPG has a difficult PC birth. Computer Games Magazine. 1998-07-27 [2010-04-14]. （原始内容存档于2002-02-25）. ^ Castomel. Final Fantasy VII—Review. RPGamer. [2008-06-16]. （原始内容存档于2016年3月6日）. ^ Final Fantasy VII - Review. rpgamer.com. （原始内容存档于2015年9月27日）. ^ Retailers Nationwide Break Official Release Date of PlayStation's "Final Fantasy VII" Videogame. Find Articles; originally published in Business Wire. September 1997 [2008-07-16]. ^ PlayStation's "Final Fantasy VII" Breaks Industry Records in Debut Weekend. Find Articles; originally published in Business Wire. September 1997 [2008-07-16]. ^ PlayStation's Final Fantasy VII Has Sold More Than Half a Million Copies to Date. Find Articles; originally published in Business Wire. September 1997 [2008-07-16]. ^ 100.0 100.1 Final Fantasy VII For PlayStation Hits Million-Unit Mark; Latest Sell-Through Numbers Make Square's Final Fantasy VII Worldwide Best Seller. Find Articles; originally published in Business Wire. 1997-12-04 [2008-10-01]. ^ Crisis Core -Final Fantasy VII-. Square Enix. 2006 [2008-07-16]. （原始内容存档于2008-08-01）. ^ McCarthy, Dave. Crisis Core: Final Fantasy VII UK Interview. IGN. 2008-04-28 [2008-12-03]. ^ Final Fantasy Retrospective Part V (GameTrailers.com feature). GameTrailers. 2007-08-13 [2008-07-16]. ^ Final Fantasy VII Advent Children. Find Articles; originally published in 1UP.com. October 2003 [2006-08-10]. （原始内容存档于2007-08-19）. ^ Kraus, Alex. 'Dirge of Cerberus' defies expectations, for better and worse. USA Today. 2006-08-29 [2008-07-16]. ^ GameSpot Editorial Team. The Greatest Games of All Time. GameSpot. [2008-07-16]. （原始内容存档于2008-12-19）. ^ GameFan Magazine; Volume 5 Issue 9. September 1997. ^ Castomel. Final Fantasy VII—Review. RPGamer. [2008-07-16]. （原始内容存档于2016年3月6日）. ^ 110.0 110.1 110.2 110.3 Final Fantasy VII. Next Generation Magazine. 1998-06-24 [2010-04-14]. （原始内容存档于1998年12月5日）. ^ Long, Andrew. Final Fantasy VII—Review. RPGamer. [2008-07-16]. （原始内容存档于2016年3月6日）. ^ 「CESA大賞'９７」受賞作品一覧. CESA. [2014-06-18] （日语）. ^ 優秀賞 - ファイナルファンタジーVII | 受賞作品 | デジタルアート(インタラクティブ)部門 | 第1回 1997年 | 文化庁メディア芸術祭 歴代受賞作品. The Agency for Cultural Affairs. [2014-06-20] （日语）. 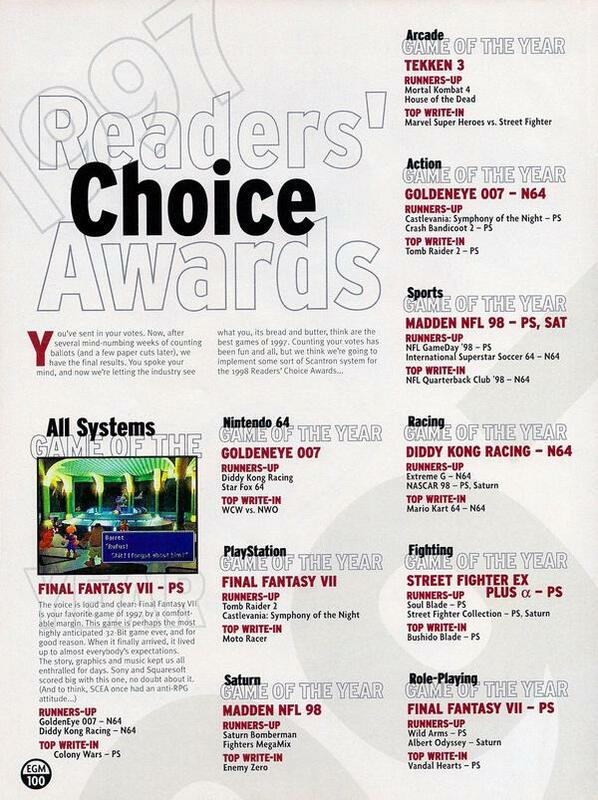 ^ 1998 1st Interactive Achievement Awards. Academy of Interactive Arts & Sciences. 1998 [2011-12-29]. ^ Origins Awards winners. Origins Awards, RPGnet. 1998-07-06 [2011-12-29]. ^ Readers' Choice Awards. Electronic Gaming Monthly. March 1998, (104): 100 [2012-02-08]. ^ 2018 World Video Game Hall of Fame Inductees Revealed. www.museumofplay.org. [2018-06-06] （英语）. ^ EGM staff. Electronic Gaming Monthly's 100 Best Games of All Time. 2001 [2011-02-14]. （原始内容存档于2003-06-20）. ^ IGN's Top 100 Games of All Time. IGN. 2005 [2010-04-15]. （原始内容存档于2009-02-09）. ^ 122.0 122.1 Gouskos, Carrie. Lucky Seven. GameSpot. [2008-09-06]. （原始内容存档于2009-03-07）. ^ The Game Informer staff. The Top 200 Games of All Time. Game Informer. December 2009, (200): 44–79. ISSN 1067-6392. OCLC 27315596. ^ Boba Fatt and the GamePros. Feature: The 52 Most Important Video Games of All Time (page 4 of 8). GamePro. [2007-04-25]. （原始内容存档于2008-09-13）. ^ Gantayat, Anoop. Nomura Talks FFXIII. IGN. 2007-11-22 [2008-07-16]. ^ GamePro Staff. The 26 Best RPGs of All Time. GamePro. 2008-11-05 [2011-02-14]. （原始内容存档于2011-11-30）. ^ Noble, McKinley. The 30 Best PSN Games. GamePro. 2010-05-18 [2010-09-05]. （原始内容存档于2010-09-24）. ^ GameSpy Staff. Top 25 Most Overrated Games. GameSpy. [2008-07-16]. ^ Reader's Choice Game of the Century. IGN. 2000-01-12 [2011-12-30]. （原始内容存档于2012-04-09）. ^ Edge Staff. Japan Votes on All Time Top 100. Edge. 2006-03-03 [2008-07-16]. ^ Romano, Sal. Famitsu's top 20 list of tear-inducing games. 2011-12-29 [2012-02-24]. ^ Spring 2004: Best. Game. Ever.. GameFAQs. [2008-07-16]. ^ Fall 2005: 10-Year Anniversary Contest—The 10 Best Games Ever. GameFAQs. [2008-07-16]. ^ Spring 2009: Best. Game. Ever.. GameFAQs. [2009-06-10]. ^ Ashcraft, Brian. Dengeki Readers Say Fav 2007 Game, Fav of All Time. Kotaku. 2008-03-06 [2008-03-29]. （原始内容存档于2008-03-28）. ^ 【アンケート結果発表】感動して泣いてしまったゲームはありますか?. ASCII Media Works. 2008-10-15 [2012-05-07] （日语）. ^ 146.0 146.1 Orland, Kyle. Final Fantasy VII ported to the Famicom. Finally!. Joystiq. 2008-02-22 [2008-02-22]. ^ Studio BentStuff (编). Final Fantasy X Ultimania Ω. DigiCube/Square Enix. 2001: 191. ISBN 4-88787-021-3 （日语）. ^ Kennedy, Sam & Steinman, Gary (编). Official U.S. PlayStation Magazine August 2001; issue 47. Ziff Davis. 2001: 90. ^ Behind The Game The Creators. Square Enix North America. [2008-07-16]. （原始内容存档于2008-04-16）. ^ Oliver, Glen. Review of Final Fantasy: The Spirits Within. IGN. 2001-07-11 [2008-07-16]. ^ Witham, Joseph. Final Fantasy X International Europe Bound. RPGamer. [2008-07-16]. （原始内容存档于2009年1月4日）. ^ Dunham, Jeremy. Final Fantasy X-2 Developer Interview. IGN. News Corporation. 2003-11-24 [2008-07-16]. ^ IGN Staff. Kingdom Hearts Final Mix Images. IGN. News Corporation. 2002-11-21 [2008-07-16]. ^ 『キングダム ハーツII ファイナル ミックス』に新要素が!!. Famitsu. Enterbrain. 2007-03-24 [2008-07-16] （日语）. ^ Kuo, Li C. Readers' Choice Top 10 Most Cinematic Moments in Gaming. GameSpy. 2007-06-25 [2007-10-16]. ^ #1 - Aerith's Death. Top 100 Video Game Moments. IGN. December 2011 [2012-01-12]. ^ Electronic Gaming Monthly October 2005. Ziff Davis. 2005: 72–73. ^ Spring 2005: Got Villains?. GameFAQs. CBS Interactive. [2008-07-16]. ^ Gantayat, Anoop. New Final Fantasy VII For PSP. IGN. News Corporation. 2004-10-27 [2008-09-15]. ^ Gantayat, Anoop. Before Crisis FF7 Details. IGN. 2004-05-27 [2008-10-08]. （原始内容存档于2012-01-23）. ^ Watanabe, Yukari (编). Final Fantasy VII Advent Children - Reunion Files -. SoftBank. 2006: 95. ISBN 4-7973-3498-3 （日语）. ^ Dunham, Jeremy. Dirge of Cerberus: Final Fantasy VII Review. IGN. News Corporation. 2006-08-11 [2008-10-08]. ^ IGN Staff. Crisis Core FFVII Update. IGN. News Corporation. 2006-05-17 [2008-10-08]. ^ Studio BentStuff (编). Final Fantasy VII Ultimania Ω. Square Enix. 2005: 572. ISBN 4-7575-1520-0 （日语）. ^ Buchanan, Levi. Final Fantasy VII Snowboarding. IGN. News Corporation accessdate=July 16, 2008. 2005-03-10. （原始内容存档于2009年2月10日）. ^ Palley, Steve. Final Fantasy VII Snowboarding Review. GameSpot. CBS Interactive. 2005-04-05 [2008-09-17]. ^ Square Enix Brings Final Fantasy VII Snowboarding and Musashi Mobile Samurai 3D Titles to V CAST from Verizon Wireless. Square Enix. 2005-03-14 [2008-09-17]. ^ 【先出し週刊ファミ通】『ファイナルファンタジーVII Gバイク』でスマホにクラウドが！　SQEX北瀬氏・間氏×CC2松山洋氏のインタビューは必見！　さらに次号も『FF』新作をスクープ!?（2014年6月12日発売号）. Enterbrain. 2014-06-11 [2014-06-18] （日语）. ^ Allen, Jason. E3 2005: Eyes-on the Final Fantasy VII Tech Demo. IGN. 2005-05-16 [2008-07-16]. ^ Final Fantasy VII remake will be more realistic - Siliconera. Siliconera.